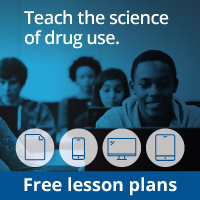 Explains to young teens how methamphetamine acts in the body and the brain and what happens with long-term use of the drug. NIDA. "Methamphetamine." National Institute on Drug Abuse, 20 Oct. 2000, https://www.drugabuse.gov/publications/mind-over-matter/methamphetamine. NIDA. Methamphetamine. National Institute on Drug Abuse website. https://www.drugabuse.gov/publications/mind-over-matter/methamphetamine. October 20, 2000.